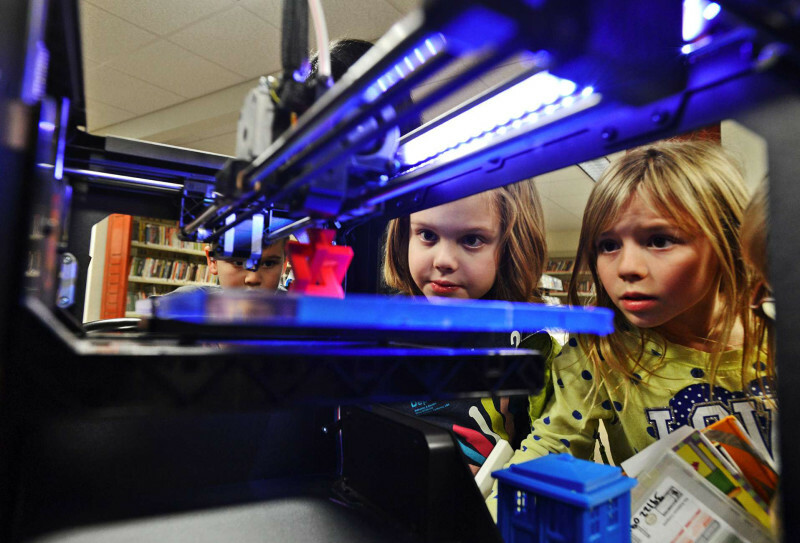 At hundreds of libraries across the U.S., 3-D printers can sometimes be heard whirring in the background, part of an effort to encourage interest in the new technology and foster DIY "maker spaces." In some libraries, officials have begun to set restrictions on the 3-D printers amid concerns about how they'll be used. At the University City Public Library in St. Louis, Patrick Wall recently printed a green plastic sword from the game Minecraft. He runs this library and was demonstrating its new 3-D printer for a group of kids and adults. The play sword took close to seven hours to print, Wall says. The printer is roughly the size of a microwave with an open space in the middle. A coil of filament feeds an extruder that moves back and forth inside, dabbing molten plastic into layers that harden. The 3-D printer, a 3-D scanner and filament cost about $4,500, Wall says. University City was the first of two public libraries in the St. Louis area to set up 3-D printers for public use. But, according to the American Library Association, more than 250 libraries across the country that have one. "It's actually part of a larger trend," says the ALA's Sari Feldman. 3-D printers are just the newest example of the interactive spaces that libraries are becoming for their communities, she says. "So, where once we thought of libraries as places where we had things for people, now we really do things for people — or do things with people," Feldman says. She says libraries large and small across the U.S. are setting up so-called "maker spaces," offering increasingly sophisticated hardware and software, including studio production equipment, design software and in some cases, even laser cutters. But Feldman says the possibilities that come with cheap, user-friendly 3-D printers have also created a new gray area in setting library policy. "There are many legal and intellectual freedom issues that need to be addressed when you make 3-D printers freely available for public use," she says. For instance, the same technology that can print a plastic Minecraft sword is also capable of printing plastic gun parts or other items. The ALA has recommended guidelines for libraries to address concerns about safety, access and liability. But some local libraries have established rules on their own. At the Pope County Library System in central Arkansas, new restrictions have been placed on its two printers. They include printing objects that are prohibited by law, or deemed obscene or otherwise inappropriate. Adult and Teen Services Librarian Sherry Simpson says there were just too many unknowns. "We want to inspire their interest in design and we want them to bring their creations to life. However, some creations probably don't need to see life through the library," she says. Like most other libraries, University City's currently has no specific limits on using its 3-D printer. Director Patrick Wall says it falls under the library's general policy that applies to 2-D printers and other services and materials. "It hasn't come up," he says. "We tend not to make policies about things that we fear might happen in the future. I'm sure there'll come a day when someone does something that we weren't expecting and at that time, we'll sit down and talk about it." And in an age where digital and technical literacy is stressed alongside traditional reading and writing, libraries are setting up plenty of space for the unexpected.